At the beginning of our look back at 1949, in the first week of reviews covering January of that year, we announced with firm assurance that the record of the year was delivered by one Big Jay McNeely. What we didn’t say, though in retrospect we probably should have, is that in addition to The Deacon’s Hop being the single which would go on to define the entire year, the overall artist of the year, the league MVP if you will, was likely to be Big Jay McNeely as well. That’s not a sure thing, which is probably why I didn’t go out on that particular limb so early in the proceedings, but the race for 1949’s Top Artist is shaping up to be about a three man race. There was Amos Milburn who if you were to count the carryover action on his late 1948 releases which were still topping regional charts in the spring of ’49, was considered the favorite. On the outside within hailing distance is Wynonie Harris who’s scoring hits again after a bit of a drought and will see even bigger releases still to come this year. But out in front at this point of the race is undoubtedly Big Jay McNeely, who heading into the year was a longshot to finish in the money. Of course out of all of them McNeely has the skimpiest credentials in terms of national hits. At the risk of giving away the final totals and removing all suspense – not that the information hasn’t been widely available for the last 69 years if you wanted to look it up – Big Jay’s national Billboard chart tally is over and done with already. Not just for 1949 after only two entries – Wild Wig being the other, which was actually released in late 1948 – but also for the next full decade! So you wouldn’t think that a lone hit released in the calendar year we’re talking about, even a #1 smash like The Deacon’s Hop, would entitle someone to be even strongly considered for the position as rock’s standard bearer for the entire season. But hits or not, more than anyone else McNeely was the purveyor of excitement in rock ‘n’ roll for the year, constantly providing unbridled exhilaration in his sonic onslaughts which increasingly came to define the music’s core appeal. Then there was the influence that went along with it, not so much for the style itself but for the no-holds barred performance aspects of his shows which became the standard that almost every great live act in rock which followed aspired to match. He also was becoming rock’s most prolific artist in terms of the sheer number of releases, this being his tenth single (either as lead credited artist or in a supporting role under Johnny Otis’s aegis) since his debut last December and already his third release in the last two months alone! Part of this was due to his having recorded for multiple labels as his first stop, Savoy, was still issuing sides on him despite his jump to Exclusive Records, which this came out on. All of that competing noise – on records usually done without any vocals with which to more easily identify them by – made buyers uncertain as to what they might be looking for. But make no mistake about it, McNeely was selling in great quantities. It’s just that Billboard magazine, which has come to be the universally recognized authority on such matters, was anything but that in 1949 when it came to accurately reflecting the tastes of young black America in their ratings which tended to favor outlets catering to adult tastes and major labels along with larger independent companies which had national distribution. Though rock was indeed making serious headway here as well, the aggregate nature of their ratings often prevented smaller labels with limited distribution and promotional funding from cracking the charts. By contrast Cash Box published countless regional listings where these companies thrived and in that realm McNeely was more than holding his own. California Hop was near the top of multiple Ohio charts, while this release, Hoppin’ With Hunter cruised into the Top Three in Virginia and sat in the Top Ten in Los Angeles. And it’s for those in California that Hoppin’ With Hunter had the most meaning. One of the important side roads we’ve taken from time to time here on Spontaneous Lunacy has to do with highlighting the handful of radio disc jockeys who’ve helped spread the sound of rock ‘n’ roll over the airwaves. In the Twenty-First century where radio is a dinosaur teetering on the verge of utter extinction it’s hard to imagine the ubiquity of the medium back in the late 1940’s, but keep in mind that television was still not in most households then and of course we were almost a half century away from the internet. To hear anything, be it political speeches, comedy shows, news or music, you either had to be there in person or listen to the radio. But black music outside of a handful of crossover artists in jazz or pop weren’t even afforded that luxury. The airwaves were segregated every bit as much as schools and trains in the 1940’s and for the majority of non-big band jazz, as well as gospel and blues, there were hardly any outlets for those records to be played on the air. When rock ‘n’ roll arrived in late 1947, a crude, vulgar, exaggeratedly over-the-top distortion and/or distillation of the aforementioned primary sources of black music, all made unrecognizable by the manner in which it was presented, there wasn’t a radio station in America that would consider it worthy of airing. But if there’s one thing even more American than racism it’s capitalism. The post-war black economic power still paled in comparison to white income but it was far larger than previously estimated and in places with a heavy black populace and already lots of competition for white ears on radio it was just a matter of time before enterprising parties began targeting the neglected African-American communities as a way to stand out and compete financially. This of course is the exact same process of focusing on reaching underrepresented segments of society that led to the formation of so many independent record companies during this decade which is where rock ‘n’ roll came to fruition. Radio, albeit in very limited fashion and centered almost entirely in the major cities which had a large enough populace to support it, followed suit and began tentatively trying to reach black listeners with shows hosted by black announcers like Willie Bryant in New York, Al Benson in Chicago and Vernon “Dr. Daddy-O” Winslow in New Orleans. In Los Angeles, ironically maybe the least rigidly segregated major U.S. city at the time, it wasn’t a black disc jockey who wound up providing this service however. 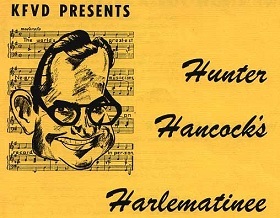 Instead it was a bespectacled white man from southern Texas named Hunter Hancock who rapidly became the go-to voice for black listeners and in doing so embraced the culture that embraced him, the two entities climbing the cultural ladder hand in hand. Hancock was born in Uvalde, Texas in 1916 and by the time he emigrated to Los Angeles in 1943 he had tried and failed at more types of employment than you’d care to imagine. 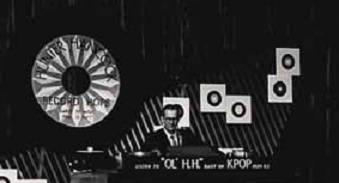 Among his last jobs in Texas though was reading commercials and news on radio in San Antonio, then acting as lead announcer at an affiliated station in Laredo. Liking the gig but hating the area he headed to Southern California and wound up at KFVD, a station so small it went off the air at sundown. When a local merchant bought an hour-long segment on Sundays to reach the African-American community Hancock was tabbed to host it, despite – in his own words – knowing nothing about black music. He spun jazz until 1947 when he begun his Harlematinee show which soon began to heavily feature the music that was born at the exact same time – rock ‘n’ roll. 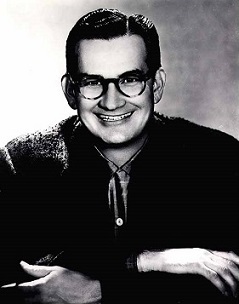 It’s been posited that Hancock thus became the first disc jockey to play rock music regularly on the air anywhere in America and while there’s no definitive way to prove or disprove that, he was certainly among the first, not to mention one of the most lastingly successful at doing so. He was dubbed “Ol’ H.H.” by black record store impresario John Dolphin, from whose storefront he would later broadcast, and while his frantic delivery and unassuming looks would seem to be an anathema to the black populace what mattered most was his genuine sincerity regarding the music he was spinning. He became not just accepted in the community, but a hero in that community as he added a Midnight Matinee show broadcast live from venues hosting rock shows and was one of the most in demand hosts for amateur talent contests that served as a breeding ground for future stars. In 1955 he even hosted a local television show on KCBS that attracted a who’s who in black rock ‘n’ roll and by the late 1950’s had begun a record label of his own whose biggest hit marked the chart comeback for one of the biggest stars in rock when Hancock was starting out – namely, Big Jay McNeely. Ahh, yes, the artist in question! Clever how we brought this full circle back to him, isn’t it? 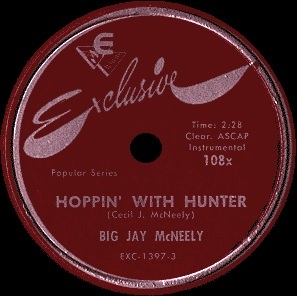 As with so many of the earlier sax instrumentals by a wide array of horn blowers in rock, the naming of the songs after an influential dee-jay was commonplace and so it should come as no surprise that Los Angeles native McNeely would call one of his many records Hoppin’ With Hunter. It should also come as no surprise that in Los Angeles this record was a Top Ten hit on the local Cash Box charts. About the only surprise is that it’s relatively tame for a Big Jay McNeely record… or at least it starts off that way. Hoppin’ With Hunter is a story in two parts… or a song in two parts since it has no words. Those parts are divergent by design and meant to take the listener from a calm, somewhat comfortable setting into one bursting at the seams and ready to explode. There’s an obvious similarity to McNeely’s classic The Deacon’s Hop, both in the structure and even the tone of the slower interludes that both feature the trombone prominently, but whereas those more subdued parts worked so well on “Deacon”, here they are the weakest parts. Maybe it’s that we’ve already been around the block with Big Jay too many times to be lulled into any sense of complacency that the monotonous groove attempts to put us in following what is actually a pretty boisterous intro. Once we downshift into the primary mellower groove though we’re simply waiting for the payoff we know is around the corner. There’s no feeling of building up to anything as much as there is just a sense of having to impatiently endure the somewhat ponderous prelude until we can be sent into orbit by Jay’s response. When Big Jay DOES cut loose the results are everything we could hope for and by this point frankly expect to hear out of him, his playing ricocheting off the walls while brother Bob McNeely holds down the bottom on his baritone sax with a vengeance. It doesn’t last nearly long enough before returning to the mild lead-in, but then again THAT doesn’t last long either before Jay rips off another solo, much longer this time, albeit more unfocused. As he careens over the second half of the record, different lines getting different emphasis, it comes across as more freestyling than we’re used to hearing by McNeely. While no sax player to date – or for that matter at any point down the road either – is as unhinged as Big Jay at his best, he’s rarely just going off the rails with no sense of direction. There’s always a well conceived master plan behind his ritualized explosions. I suppose there is here as well, but it’s a recycled one that doesn’t keep quite the anticipation or the detonations intact. There’s still plenty to enjoy but Hoppin’ With Hunter is frayed at the edges, its concept a bit ragged and worn down by overuse. This is probably to be expected considering how much material McNeely was churning out, all of which was aiming for the same basic response, so it’s frankly amazing that the results were usually quite different. This is one time where he comes up short in that regard, but even so it’s not so misguided that it’s a blight on his résumé by any means. When looking back from the vantage point of seven decades later the encouraging thing of course is how both Big Jay McNeely and Hunter Hancock fueled the rise of rock ‘n’ roll in Los Angeles, establishing its popularity in the earliest days with a succession of ever wilder records and live gigs by McNeely generating the groundswell of excitement for the music which the equally outrageous promotion by Hancock over the airwaves turned into a cultural tsunami. Unlike many others in similar circumstances at the time whose careers rose quickly and reached phenomenal peaks only to see their fortunes rapidly fall when the next wave of artists unleashing the next new sound in rock overtook them, both McNeely and Hancock remained fixtures in L.A. for years largely because they were genuinely committed to delivering the anarchic atmosphere that all fans of rock music craved regardless of era. As a result they each were able to ride out the tidal wave of enthusiasm into the early 1960’s when ultimately it was left for a later generation, those raised on the records of Big Jay being spun nightly by Hancock to take it even further. That this particular record doesn’t quite live up to either of their names or legacies is nothing to hold against them, not when they were responsible for so much of the pandemonium that defined rock ‘n’ roll for an entire region in the first place. Leave a reply on "Big Jay McNeely: “Hoppin’ With Hunter”"